This is story about inexplicably losing something very precious and then inexplicably getting it back. The year was 2009 and my life wasn’t really going the way I’d wanted it to go. I was stuck in a really bad job, the kind of job that was soul crushing and hazardous to your health. I was working in a really dirty environment—there was a lot of dirt, dust, and wood particulate in the air I was breathing and I developed allergies. One morning I woke up and discovered, to my horror, that I had diminished hearing in my right ear. Before jumping to any conclusions, I decided to try cleaning my ear out. So I used an over-the-counter-ear-douche-thingy and proceeded to mindlessly clean my ear. In the meantime, I lived a strange sort of half-life. I wasn’t able to enjoy many of the things I normally loved. Not only was it frustrating to not be able to hear songs, television, and phone calls—but having trouble hearing these things also served as an unpleasant reminder that something was wrong with me. When the problem didn’t sort itself out and go away, like I’d hoped it would, I decided to break down and see a doctor. After a quick check of my ear, which I was told were immaculately clean after my many ear-douchings, I was told that it was probably just my clogged sinuses. I was given some medicine and within a few weeks I was mostly all better. I still occasionally have hearing issues in my right ear, especially during “allergy season” which is pretty much all the time in my part of the country. But it could be worse; my flirtation with deafness could have been permanent. As a music nerd and rock geek, I can’t imagine a life without music. 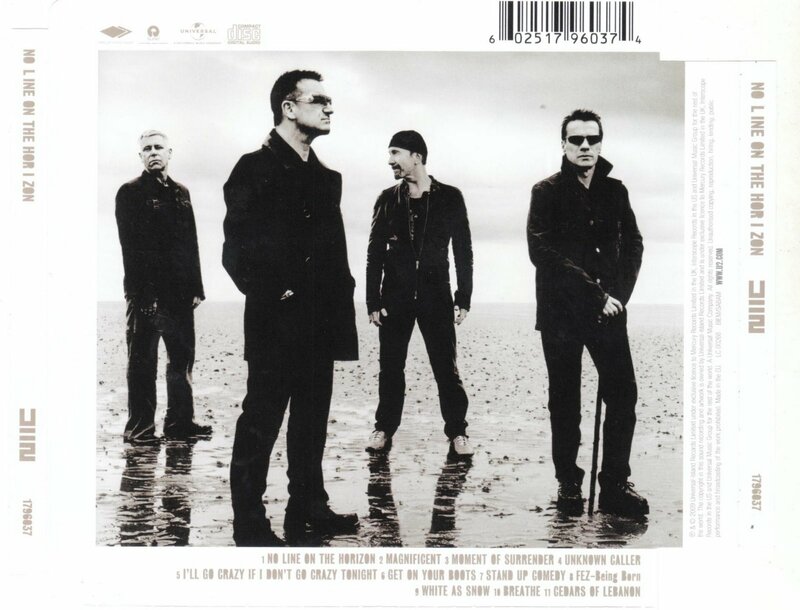 When my ear was really bad, U2’s album NO LINE ON THE HORIZON came out. Despite my diminished hearing, I went out and bought the album. I popped it into the CD player of my car and struggled to get into the songs, but I wasn’t in the mood and I couldn’t really enjoy it. Later on, when my hearing problems pretty much went away, I heard a few of the songs—mostly used in advertising. I didn’t think they were horrible, but I didn’t have much enthusiasm for listening to the album. I tossed NO LINE ON THE HORIZION aside and life moved on. I got to thinking about all of this because I bought a new computer at the end of last year and I’m in the process of putting all my music into my new computer’s library. I’ve been doing it slowly, piece-by-piece. At first I thought I wasn’t going to try and replicate my old iTunes library, but I’m pretty moody when it comes to music. Albums and songs I didn’t miss or need last week are suddenly giant, embarrassing holes in my computer’s collection. So I said “the hell with it” and have started piling it all onto my hard drive—and during the project I happened upon NO LINE ON THE HORIZON. I still have it, because years ago I forever gave up on the notion of selling my CD’s. Once, during a very dark period of my life, I was unemployed and forced to liquidate a rather substantial portion of my CD collection. I only sold things that I was certain I would never miss, but alas, I’ve spent the better part of a decade re-buying many classic, essential albums. Of course, I didn’t re-purchase that Shaggy album and a few other dodgy musical choices I’d made in my youth. Between the years of 2001 and 2007 U2 was a very big influence on me. Prior to that time I’d had THE JOSHUA TREE for many years but was otherwise a pretty casual fan. But their surprising return-to-form on 2000’s ALL THAT YOU CAN’T LEAVE BEHIND really made me a U2 fan. That album and those songs were everywhere in late 2000 and early 2001. I saw the band perform in November of 2001, and to this day it’s one of the best large-arena rock shows I’ve ever attended. Bono and the band were a soothing, positive influence during a really scary time. The 9/11 attacks in New York and my newly acquired draft card weighed heavily on my mind, and U2’s music helped calm me down and put things into the proper perspective. I was so inspired by the band, and Bono’s philanthropy, that I joined Amnesty International after spotting the organization’s name in the liner notes for ALL THAT YOU CAN’T LEAVE BEHIND. I also dove back into U2’s back catalogue and became an even greater admirer. Of course, doing this put the band’s next album, HOW TO DISMANTLE AN ATOMIC BOMB, into greater perspective. Still, though the band’s previous output might have put their new music to shame, it was better than most what was being played on the radio. My super-fandom of U2 ended around the time I moved out of my parent’s house and went to college. U2 was replaced by newer bands, most of whom I will admit have very little to say. Or have very little they’re willing to do to help make the world a better place, which is one thing U2 can never be faulted for doing. I think we grew apart, like high school sweethearts who mature in opposite directions. I quit Amnesty International after I heard one of their mouthpieces say some foolish things on CNN. I rejected a lot of classic rocks bands I’d loved when I was growing up. I was willing to give U2 my time and money when NO LINE ON THE HORIZON was released, however I think the purchase was mostly made to honor a band I’d once loved very dearly. The bottom line is that I’m not sure I’d have given it much consideration if my hearing had been perfect. Sometimes things fall through the cracks, and NO LINE ON THE HORIZON definitely fell through the cracks. I’ve decided that tomorrow I’m going to get up, put on headphones, and listen to NO LINE ON THE HORIZON in its entirety. I’m not sure if this is a worthy exercise, but I do feel like I owe it myself and to U2. I’m curious to see how I’ll react to it. The last time I thought about or listened to U2 was back in the autumn of 2009 when I saw the fantastic documentary, IT MIGHT GET LOUD, which featured The Edge. After seeing that film I immediately had a hankering for classic, 1980’s U2—a hankering I satiated with the astoundingly dense OCTOBER record. What will I find, and how will I feel when NO LINE ON THE HORIZON ends? I will report back in Part II The Review.